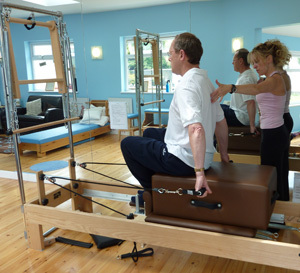 Pembrokeshire Pilates is committed to providing high quality Classical Pilates training the way Joseph Pilates intended, in small classes and in private one to one sessions. Group classes run weekly in school term time in our own studio in Narberth as well as Pembroke Town Hall and Cosheston Village Hall. Private one to one, and up to one to twelve person sessions are run from our studio in Narberth, where larger equipment is available for use. These classes are tailored to suit the individual requirements of the clients. This especially suits rehabilitation needs. Equipment used in mat work classes includes mats, magic rings, wedges, bands, poles, and small soft balls - All supplied. Equipment used in our studio includes reformer, wonder chair, foot correcter, rings, large and small balls, bands, weights, mats, wedges and poles. We do recommend that new starters attend a one to one introductory session at our studio prior to starting a group class. This allows time, for your instructor to get to know your strengths, weakness's and aspirations, to carry out a postural analysis and introduce the new client to the Pilates Method which helps prepare the mind and body for the class situation; You will know what to expect! All classes and studio sessions must be pre booked and paid for in advance to secure your place.